Freedom of the Press? Or Espionage? "America, a place where the people’s right to know is viewed as superseding the government’s right to hide its business." Alan Grant: Audrey Hepburn and Grace Kelly backstage at the 28th Annual Academy Awards, March 21, 1956. Neither Grace Kelly nor Audrey Hepburn were nominees at the event in RKO Pantages Theatre. Grace Kelly presented Best Actor Oscar to Ernest Borgnine for Marty, and Audrey Hepburn presented the Best Picture to the same film. That year, Anna Magnani won the best actress award for The Rose Tattoo, and Jo Van Fleet won the award for best supporting actress for East of Eden. Allan Grant (1919-2008) was a Life magazine photographer–the last photographer to photographer Marilyn Monroe before she died on August 5, 1962, and the first to photograph Marina Oswald after the assassination of John F. Kennedy in 1963. The NYPPA has just posted the winning images (in no particular order) and will announce the Winning images and their order at a dinner that is tentatively scheduled for May 31st 2012. Readers of this blog will be familiar with Bill Eppridge. After his graduation from college, Eppridge worked for NATIONAL GEOGRAPHIC and then went on to work for LIFE. During the 1960s and until the magazine folded in 1972 Eppridge was a staff photographer for LIFE. He covered many topics and news events, often finding himself in history-making situations.While working for LIFE, Eppridge photographed celebrities such as Alan Alda on the set of M*A*S*H, Gene Hackman, Raquel Welch and others. During the Apollo 13 mission, Epperidge was the only photographer allowed into Marilyn Lovell’s home even as her husband was stranded in orbit above the moon. In 1968 while five feet in front of his subject and friend, Robert F. Kennedy lay on the floor of the kitchen of Los Angeles's Ambassador Hotel, mortally wounded by a bullet fired by Sirhan B. Sirhan. Eppridge went into the crowd and began holding people back, but every once in a while, he would reach down and click his camera. This last week, Bill's photographs of 1960's skateboarders went viral on the internet. Bill recalls that he photographed skateboarders in Central Park during a competition and kids on the streets in NYC. He says that there were lots of skateboarders around then, and despite what some blogs claim, he never "handed out" skateboards. Some of the photos that were included were actually shot at Weslyan University in Middletown, CT, aloso at a skateboarding competition. A special selection of Bill Eppridge's photographs will be on exhibit during the AIPAD Photography Show at the Park Avenue Armory in New York, March 28 - April 1. Visit Monroe Gallery, Booth #419. The US-born Sunday Times journalist Marie Colvin and French photographer Remi Ochlik have been killed after shelling hit a safe house for journalists in the Syrian city of Homs. "As I prepare my legal battle against the Miami-Dade Police Department for falsely arresting me and for deleting my footage, I am seeking new ways to raise money for my legal defense fund. I recently entered into a business venture with Keith Robertson, a Vancouver man who runs Zap Rag, a company that sells lens cloths and laminated cards with photo laws printed on them. The items are designed to be used by photographers when they get harassed by cops or security guards for shooting in public." Elsewhere: "Today, the NPPA sent another letter of protest to U.S. Parks Police Chief Teresa Chambers asking her to investigate allegations that a photographer was arrested and detained for 48 hours without being formally charged." Full post here. 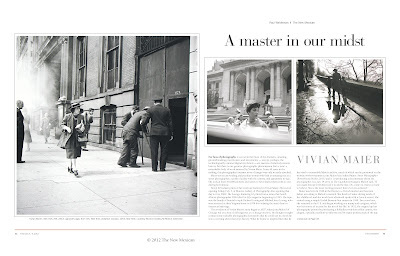 "Vivian Maier is one of those exceptionally rare things - an artist without a biography. She can’t tell us why she took these photographs, or explain what or who she was influenced by so it’s up to us to decide, if we want to. All we have to go on is the images she left behind. As such, Maier is a gift to critics, who I have no doubt will busy themselves defining her 'value' and what her work 'means' for quite some time to come. My advice is to find this book in your local bookshop, and spend an hour or so leafing through it. 'Street Photographer' is an exhilarating collection and a welcome reminder that greatness and fame are two very different things." Vivian Maier: Discovered on exhibit through April 22, 2012. The Radical Camera: New York's Photo League, 1936-1951, currently on view at the Jewish Museum in New York through March 25, includes several photographs by Ida Wyman. "Ida Wyman took great advantage of this unique object for her 1947 photograph Sidewalk Clock, an image that captures the spirit of women’s progress in postwar America. In it, a professional woman in stockings and high heels marches confidently across the frame. The woman is in sharp focus, while the enigmatic clock appears hazy, as if it can barely keep pace with her. Wyman herself was enjoying a successful career as a freelance photographer when she took the picture. 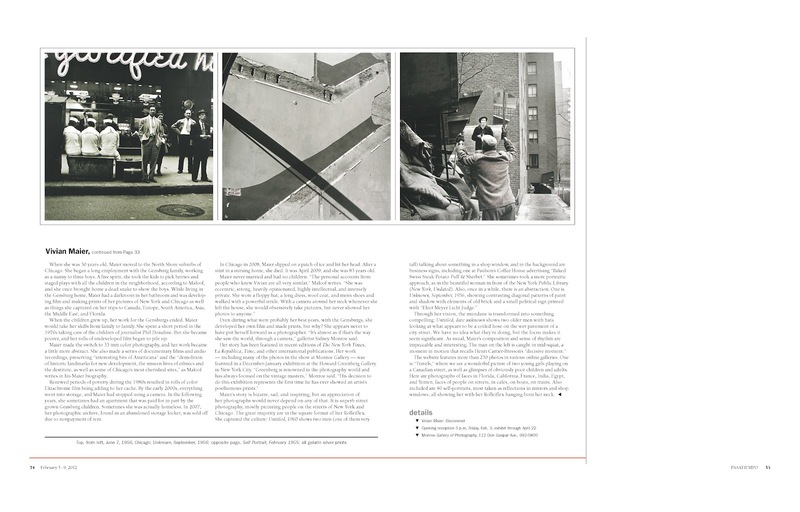 Following in the footsteps of acclaimed photojournalists Margaret Bourke-White, Dorothea Lange, and Berenice Abbott, she published her pictures in popular magazines such as Life, Fortune, and The Saturday Evening Post, an early joiner to the ranks of professional women photographers." "(Grey) "Villet really fits into that ICP/Cornell Capa tradition—not only with photojournalism but this real interest in ordinary people and their lives." "My sense of his power as a photographer was very great, and I was beginning to lose all hope that I was going to get this beautiful work out there." "Villet shot for LIFE in both its weekly and reinvented monthly iterations between 1955 and 1985, producing some 40 full-length features of remarkable emotional and intellectual range—from a 1962 visit inside Synanon House, a controversial drug-treatment facility in California, to "The Lash of Success," an allegorical look at a Chicago furniture-chain owner whose abuse of power ultimately destroyed what he'd built. His mid-'70s essay about a hospital nurse, "More Than Compassion," like W. Eugene Smith's "Country Doctor," is a striking examination of life and death. Yet Smith's 1948 essay is legendary, and Villet's is hardly known." "Grey was able to tell a story about something people necessarily hadn't gotten their minds around," said David Friend, who worked with Villet at LIFE as a reporter and picture editor. "It's not necessarily about [Henri] Cartier-Bresson's 'decisive moment'; it's about the collision or dovetailing of images that add up to a greater whole." Among his own kind," Mr. Friend said of his former colleague, "he was revered." "His work is every bit as important as those who were so well known," said Sidney Monroe, whose Santa Fe-based gallery represents Villet's estate." View Grey Villet's photographs during the AIPAD Photography Show March 28 - April 1 at Monroe Gallery of Photography Booth #419.
not just who arrived on the island. Officials of Ellis Island estimate that as many as one in three Americans can trace their ancestry to immigrants who landed there from overseas. Now, the officials are focusing on the other roughly 200 million newcomers who arrived in the United States before Ellis Island opened its doors or after it stopped becoming a portal for immigrants. The national historic site in New York Harbor is halfway through a transformation into a more inclusive National Museum of Immigration. “The Ellis story is a finite story; American immigration is continuing,” said David Luchsinger, the National Park Service superintendent who oversees the island and the Statue of Liberty. As part of a $20 million project privately financed by the foundation, 20,000 square feet, comprised of a former railroad ticket office and offices for Park Service staff, are being converted into a new museum that encompasses the story of immigration from the 16th century through today. The first phase, which covers 1550 to 1892, when Ellis Island began operating as an immigration station, opened informally last fall. The second phase, which focuses on the period after 1924—, when strict quotas on foreigners were imposed and the island was used primarily as a detention center—, and especially on the influx following World War II, is scheduled to open about a year from now with a formal ceremony to celebrate the new museum. Note that the right to photograph does not give you a right to break any other laws. For example, if you are trespassing to take photographs. Today the winners of the prestigious 55th annual World Press Photo competition were announced in Amsterdam naming Samuel Aranda from Spain as the World Press Photo of the Year 2011. "They called me yesterday around 7pm, and told me that I had won the World Press Photo," Samuel Aranda tells BJP in his first interview of the day. "At that exact moment, I was checking my bank account because I didn't know how I was going to pay my rent this month. I was crunching numbers to make it work." World Press Photo: Does the winning image reference Michelangelo's Pietà? Smith and Carlos, the 200m gold and bronze medallists, don black gloves and give the Black Power salute on the podium in Mexico in 1968 Photo by John Dominis ©Time Inc. The Guardian has been publishing a series of memorable Olympic moments as a lead up to the 2012 London Olympics. "On 17 October 2005 a 20ft-high statue was unveiled at San Jose State University showing their former students Tommie Smith and John Carlos frozen, fists aloft, as they had stood exactly 37 years earlier on the Olympic podium in Mexico City. "Tommie Smith and John Carlos stood for justice, dignity, equality and peace," reads the inscription. "Hereby the university and associated students commemorate their legacy." Two years later Smith published his autobiography. In 2008 the pair were given the Arthur Ashe Courage Award at the ESPYs, something akin to an American Sports Personality of the Year awards. Carlos's own autobiography followed last October. This, now, is their life, full of speaking engagements and interviews, publicity and publication, applause and acclaim. In the moments before the medal ceremony in Mexico City, Carlos, Smith – as of a few moments earlier the 200 metres world record-holder – and the Australian silver-medallist Peter Norman sat in a room the athletes called "the dungeon", deep in the bowels of the Olympic Stadium. As they prepared, they discussed what was about to happen. One of the things mentioned was the possibility of them being murdered on the spot. "I remember telling Mr Smith: 'Remember when we get out there, we've been trained as runners to listen to the gun,'" Carlos has said. "'So when we get out there and do what we do, if the hammer hits that bullet, hit the deck. Don't be just a duck on the table for them to just shoot at.'" Concurrent with the opening of Vivian Maier: Discovered, we are pleased to exhibit selected photographs Grey Villet shot of the Richard and Mildred Loving for Life magazine in 1965. "Grey Villet: The Lovings" will continue through March 18, 2012. The Loving Story, a documentary film, tells the story of Richard and Mildred Loving to examine the drama, the history, and the current state of interracial marriage and tolerance in the United States. It's World Premiere was at the Full Frame Documentary Film Festival in April 2011, and the On-air premiere of The Loving Story will be on HBO, February 14, Valentine’s Day, 2012. A selection of Grey Villet's photographs, including several of The Lovings, will also be on exhibit during the AIPAD Photography Show in New York March 28 - April 1, at Monroe Gallery Booth #419. "I always think that if I had had any money and any decent equipment, I would never have taken that picture"
Pasatiempo is the in-print, nationally-acclaimed, arts and culture magazine published by The New Mexican. 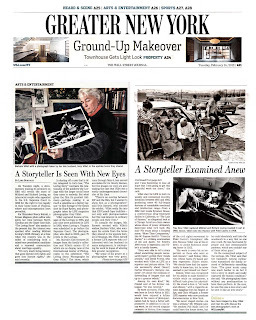 "Vivian Maier Discovered" is the feature article in today's edition, click to enlarge:. An international sensation is coming to Santa Fe. In the past couple of years, the world of photography has been shaken by the discovery of a cache of negatives and undeveloped film rolls shot by a woman named Vivian Maier. The discoverer, a photographer and collector named John Maloof who lives in Chicago, found the trove in a couple of trunks he bought at a 2008 public auction of items from a storage unit. Curious, he began printing the negatives and realized that they were what is called “street photography;” that is, pictures taken on the Chicago streets in the 1950s and ’60s. But these weren’t just good photographs, Maloof decided, they were great. Finding her name on a photo-lab envelope, Maloof Googled Vivian Maier and discovered that she was ill. By the time he made up his mind to try to reach her in 2009, she had died at age 83. He began working with curators and photographic experts, all of whom were as excited by his find as he was. In the past 18 months, Maloof has spread the word about this extraordinary photographer. Her photographs have been shown in the United States and Europe, and published in a book about her and her work, “Vivian Maier: Street Photography” (PowerHouse Books, 2011). An exhibit of 35 photos of her photos opens today at Monroe Gallery of Photography on Don Gaspar Avenue. century,” gallery owner Sidney Monroe said in a written release about the show. “The story is really fascinating,” Monroe said in a separate interview. “Little is known about her. She was born in New York in 1926 and she worked as a nanny in Chicago all her adult life. When at the end of her life she was very poor, some of the children she’d taken care of banded together and took care of her. She never talked to anybody about her photography and never showed it to anyone. “John Maloof has spent four years with some of the best photography curators doing research and cataloguing her work, to preserve her legacy. It’s become his full-time avocation. Her work is not only good but shockingly good,” Monroe said. The 35 prints being shown in Santa Fe are a selection by Maloof and Monroe, some of them also seen in the book. Copies of the book will be available at the gallery. Reportedly, Maier was a quiet, almost aloof person who often was seen on the streets of Chicago with a Rolleiflex camera around her neck. People posed for her willingly, apparently never asking themselves what she was doing with the pictures. She managed to amass more than 2,000 rolls of film, 3,000 prints and 100,000 negatives that she shared with virtually no one during her lifetime. Her black and white photographs form indelible images of the architecture and mid-century street life of Chicago. She rarely took more than one frame of an image and seemed to concentrate on children, women, the elderly and the indigent. There are also a series of striking self-portraits and a series of prints from her many travels to Egypt, Bangkok, Italy and the American Southwest. Monroe obviously is as infatuated with Maier’s story and work as Maloof and the other curators. “It is hard enough to find this quality and quantity of fresh and moving images in a trained photographer who has benefited from schooling and a community of fellow artists,” the veteran photography enthusiast wrote. “It is astounding to find it in someone with no formal training and no network of peers. Maloof is almost as interesting as the woman whose legacy he has been fighting to rescue. A native Chicagoan, he is a collector and writer who has become a street photographer himself in response to working with Maier’s photographs. “I guess you can call me a street photographer. I always have my camera with me to document interesting moments or stories I come across in my life. I’m not a commercial photographer and not interested in becoming one. Photography is a personal obsession of mine,” he wrote in a blog on his own website. Maloof also created vivianmaier. com, where he has written about his work on her behalf, always calling her by her first name. After so much work reviving her imagery, it appears, he seems to feel a kinship. “I acquired Vivian’s negatives while at a furniture and antique auction while researching a history book I was co-authoring on Chicago’s Northwest Side. From what I know, the auction house acquired her belongings from her storage locker that was sold off due to delinquent payments. I didn’t know what ‘street photography’ was when I purchased them,” he blogged. “It took me days to look through all of her work. It inspired me to pick up photography myself. Little by little, as I progressed as a photographer, I would revisit Vivian’s negatives and I would ‘see’ more in her work,” he wrote. “I bought her same camera and took to the same streets, [only] to realize how difficult it was to make images of her caliber. I discovered the eye she had for photography through my own practice. Needless to say, I am attached to her work. “After some researching, I have only little information about Vivian. Central Camera (a 110-year-old camera shop in Chicago) encountered Vivian from time to time when she would purchase film while out on the Chicago streets. From what they knew of her, they say she was a very ‘keep your distance from me’ type of person but was also outspoken. She loved foreign films and didn’t care much for American films. “Some of her photos have pictures of children and oftentimes it was near a beach. I later found out she was a nanny for a family on the North Side whose children these most likely were. One of her obituaries states that she lived in Oak Park, a close Chicago suburb, but I later found that she lived in the Rogers Park neighborhood. “Out of the more than 100,000 negatives I have in the collection, about 20,000-30,000 negatives were still in rolls, undeveloped from the 1960s-1970s. I have been successfully developing these rolls. I must say, it’s very exciting for me. Most of her negatives that were developed in sleeves have the date and location penciled in French (she had poor penmanship),” he added. “I found her name written with pencil on a photo-lab envelope. I decided to Google her about a year after I purchased these only to find her obituary placed the day before my search. She passed only a couple of days before that inquiry on her. I wanted to meet her in person long before I found her obituary but the auction house had stated she was ill, so I didn’t want to bother her. So many questions would have been answered if I had,” he wrote sadly. Maloof added that he wanted to thank everyone for their support and encouraging emails. “There’s a lot of weight on my shoulders and I hope I’m doing the right thing for Vivian’s legacy,” he said. This September 1956 photograph shows a woman standing next to a bus. Titled “Sept., 1956, New York, N.Y.,” it was taken by street photographer Vivian Maier. This untitled photograph of a man carrying a newspaper was taken by Vivian Maier in Chicago. “New York, Undated” is a gelatin silver print from a photograph by Vivian Maier. “June 7, 1956, Chicago” is a gelatin silver print from a photograph by Vivian Maier. This Aug. 11, 1954, photograph of a boy and a horse was taken by Vivian Maier in New York City. The gallery is open daily 10 to 5. The New York Times fired off another letter to the Police Department today on behalf of 13 New York-based news organizations about police treatment of the press over the last several months. The first letter, sent back in November during the height of the Occupy Wall Street demonstrations, resulted in a meeting with NYPD brass and "stepped up" efforts on the part of the department's public information office to train officers in working with the media. But in today's letter, a copy of which was obtained by Capital, the news organizations, which also include the New York Post, Daily News, Associated Press, Reuters, Dow Jones, Bloomberg News, the National Press Photographers Association, several local TV affiliates and others, say problems have persisted. "There have been other reports of police officers using a variety of tactics ranging from inappropriate orders directed at some joumalists to physical interference with others, who were covering newsworthy sites and events," the letter reads. "Indeed, as recently as this Monday it was reported ... that at another OWS demonstration, police 'officers blocked the lens of a newspaper photographer attempting to document the arrests.'"